I liked the Imola track from the moment I heard it: you have to love a track where you can hear the high-pitched whine of V10 engines from the railroad station! But that's the kind of place Imola is, a charming Italian town not far from Maranello, totally absorbed by and given over to the Grand Prix on race weekend. And it is an old-fashioned kind of place, where the paddock is sandwiched in between the swollen banks of the Santerno River on one side and the main straightaway on the other, all of it set out beneath an impressive stand of tall and willowy trees that grow in profusion throughout the Emilia-Romagna region of Italy. And what do the drivers do all weekend when they are not in their cars as we see them on TV? They divide their time between both sides of Main Street, hobnobbing as required with sponsors and the team bosses in the hospitality motorhomes, hanging out in the garages kibitzing with the mechanics into whose hands they will entrust their lives, or meeting in the working areas of the motorhomes after each practice session and qualification for "de-briefing," where the team strategists, engineers and the drivers try to make sense of what the car is doing. No one but this inner circle is allowed into these meetings. 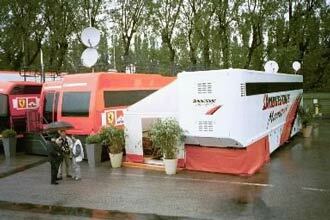 Ferrari has a special motorhome for these meetings and its roof bristles with antennas and other communications paraphernalia. Ross Brawn, ever the Englishman, takes a cup of tea with him, saucer and all, to the team meetings. 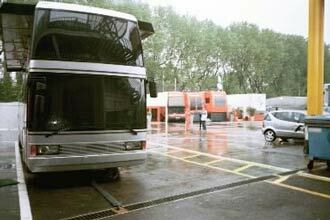 Reporters from the Italian press linger near the motorhome, waiting for "Schumi" to emerge. Each of the drivers and each of the teams manifest a particular character throughout the weekend. Jos Verstappen could be seen engaged in substantive chats with the tire engineers from Bridgestone, checking the tread wear and trying to make the Arrows-Asiatech (nee Peugeot) go faster through the corners. On another occasion, Verstappen could be seen jawboning with ex-Arrows teammate Pedro de la Rosa, now wearing a green Jaguar jacket. I doubt Eddie Irvine will be calling in sick this season: de la Rosa looks ready to pounce. Over in the Sauber area, there are no signs of girlfriends in the hospitality area in Romantic Italy this weekend, but the drivers spend lots of time there, posing for pictures with Peter Sauber and his sponsors and enduring endless interviews with reporters. Ruddy-cheeked Kimi Raikkonen carries himself older than his years (he's all of 20 and about to start his fourth Grand Prix) and snaps to attention when Peter Sauber summons him for a picture. Nick Heidfeld, having finished fourth in Australia and reached the podium at Brazil, has fully recovered from his Baptism of Fire at Prost and oozes self-confidence. He spent his time entertaining some friends his own age ("Quick Nick" is senior man on the team, pushing 24) in his spare time at the motorhome; a few tables away, Peter Sauber entertained friends of his own age. The Rule of the Paddock seemed to be that the more successful the team the less visible the drivers. Pescara, Italy, is just down the road from Imola so Pescaran Jarno Trulli was much in evidence at the Jordan motorhome and the always pleasant and fan-friendly Heinz-Harald Frentzen spent his share of time there too: team boss Eddie Jordan could usually be found at the table nearest Main Street, hailing one and all who entered the motorhome with his Irish Blarney. Jaguar's giant chrome cat hood ornament was not protruding from the top of the motorhome at Imola as it was last season at Silverstone, but inside the entranceway were two friendly Maidens of the Motorhome offering visitors something hot or cold to drink and across from their mini-bar sat two high-tech computers supplied by one of Jaguar's sponsors, Hewlett-Packard, where journalists could check the F1 websites as to what they missed while watching Bernie's Digital TV in the Media Center. One of the hardships of the weekend was dealing with manipulating the mouse while balancing a cup of cappuccino! Everybody who was anybody at Jaguar wandered in and out of the motorhome throughout the weekend, including Bobby Rahal, who sometimes held his meetings right out in the open, and Eddie Irvine and Luciano Burti, who lingered nearby the eating area. Having had his commitment questioned in the press, Eddie seemed to be trying hard all weekend and just missed out on a fabulous qualifying lap when he came into the pits on his twelfth lap which was still clocked at 1:26.754. Irvine discovered too late in the weekend that for some reason his Michelin tires were faster on the in-lap, something the team will be trying to capitalize on in the future. Had Eddie been able to complete his last lap his qualifying time would have been higher than the thirteenth place he ended up on the grid. Indeed, in first practice, Eddie had been seventh overall. Luciano Burti was his quiet, workmanlike self throughout the weekend but went off into the tire barriers during practice in the wet, minimizing his track time. He ultimately qualified only fifteenth but nursed the Jaguar home in the race to eleventh place despite losing at least two gears. With Jaguar test driver Pedro de la Rosa hovering in the wings, the rumors were that Burti would be out of a drive after Imola and, indeed, the team subsequently announced that de la Rosa would take over Burti's seat as of de la Rosa's home race, the Spanish Grand Prix. While mooching off the kindnesses of the Jaguar motorhome, I had a few minutes with Bobby Rahal. I pointed out that it took Jean Todt almost 7 years to take Ferrari from the doldrums to the World Championship and wondered if the 3 year turnaround time frame he had set for Jaguar to get to the front of the grid was doable in a corporate culture like Ford, owners of Jaguar, where shareholders and the company's officers and directors tend to think in terms of quarterly not yearly results. His reply was an interesting one: "I don't think I have three years [to produce results]." But Rahal and his team are flat out to make up for the sins of the past and even Niki Lauda - who has variously been associated as an advisor both to McLaren and Ferrari - has staked his reputation on making Jaguar a successful Formula One team. As head of Ford's Premier Automotive Group (which has both Jaguar and Cosworth under its umbrella) Lauda was quoted in Formula One Magazine as defining his role at Jaguar as follows: "to assist Bobby Rahal, to give him all available support from the rest of the group ... this means if he is lacking horsepower I have to deliver horsepower." I suspect Bobby will be making that call for horsepower shortly as he moves into the sixth month of his three-year challenge. As his form of sacrifice for Jaguar, Niki has also let it be known that he will drive daily to work from Knightsbridge in London to Milton Keynes rather than be helicoptered to work as is Patrick Head of BMW-Williams. Since Flavio Briatore also drives to work every day from London to Benetton's factory in Oxfordshire, perhaps ITV ought to be covering the M1 in the wee hours. 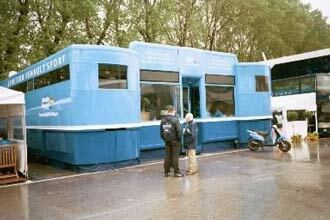 Even before they won the race at Imola, the BMW-Williams motorhome was bursting with activity given Ralf's ill-starred but impressive performances in all three prior races and his teammate Juan Pablo Montoya's new-found stardom because of The Pass at Brazil in Turn 1 on Michael Schumacher. Although both drivers are 25 years old, Ralf somehow seems the younger of the two in his demeanor and is not yet as polished as his older brother; Montoya remains as accessible in the Formula One paddock as he was in CART and at Indianapolis, but I have not seen him high-five it with Patrick Head yet as he used to with ex-team boss Chip Ganassi. Having seen Ralf run a masterful and courageous race at the Nurburgring in 1999 under difficult wet/dry conditions, only to see it go down the drain because of a Bursting Bridgestone, it was fitting that his first win should come on tires supplied by Michelin (their first win too since returning to Grand Prix racing), the Loyal Opposition. All of a sudden, the machinations of Frank Williams, Patrick Head and Gerhard Berger over the past two seasons have come into focus and they may well have the strongest driver duo, the most powerful engine and the best tires on the grid, especially in dry conditions at the faster circuits on the calendar like Hockenheim and Monza. By the way, towards the end of the Imola race when it appeared Coulthard was making inroads from second place and that Ralf was dropping his revs and the explanation "Oil Pump" popped up on the TV screen, it was thought that the BMW was developing problems. When asked about the oil pump problem after the race, Gerhard Berger quickly dismissed the supposed problem saying it was "routine." (Berger has clearly made the transition from driver to spokesman!) Berger also said that he was very impressed with Ralf in the last few laps because he dropped his revs and controlled his pace without any coaching from the pits. With the Imola race run - Williams's first victory since 1997 - even Frank Williams seemed pleased as he was wheeled back by an aide to the motorhome from the garage, accepting congratulations from one and all along the way. Indeed, even arch competitor Ron Dennis of McLaren and Norbert Haug of Mercedes-Benz took off their hats to the Williams team and the Bavarian Motor Works for their rapid ascent. Michael Schumacher's reaction to his younger brother's win - if I have to lose, I am glad it was to my brother - was mirrored by the sentiment of Ron Dennis to the effect that if McLaren has to lose, he was glad it was to another team owner from the Old School who is as passionate about Formula One as he is, Frank Williams. Adrian Newey stayed home from Brazil to go back to his drawing boards, so you can be sure the Battle of Britain is on again after the results at Imola. Someone who did not stay home was CART Team Owner Roger Penske, who was at Imola on a non-CART racing weekend visiting his friends at Mercedes-Benz with whom he won the 1994 Indy 500. Ferrari World Champion Phil Hill was another American in the Paddock, watching his son Derek Hill's progress in F3000. As for the McLaren drivers, seen at close range they are both impressive in their own ways. David Coulthard seems arch and terse in the post-race press conference but at the mass interviews outside the Media Center he is completely at ease, witty and masterful. And he has prodigious staying power: Coulthard, who finished in second place, answered every last question of every reporter and TV crew who wanted a quote or a sound bite and stayed there long after first place Ralf and third place Rubens had fled the scene. As for Mika, I saw no Iceman at Imola. One of my favorite images of Imola was at 7:45 A.M. on Sunday morning when I came through the gates of the paddock and ahead of me on the Ramblas was the newest father and mother in the pitlane, Mika and Erja, arm in arm, no photographers or camera crews around to ruin a genuinely romantic moment. It was the same Mika who instinctively reached out to comfort Michael Schumacher by putting his arm around him when Schumacher broke down in tears at Monza last year at the mention of Ayrton Senna's name. The Nicest Man Cometh. A less romantic but equally human early morning sight was that of Jacques Villeneuve sleepily making his way from the BAR-Honda motorhome, where he slept, over to the team's hospitality center for breakfast. In scholarly-looking glasses and sporting his natural hair color and a beard, Jacques looked for all the world like a rumpled college student late for his first class on Monday Morning. And speaking of rough weekends, Alain Prost - who won Imola three times as a driver - and his team manager, Jean Villadelprat, were also among the early risers, engaged already in a heavy discussion that doubtless focused on the recurring issue at Prost: how can we make the Ferrari drive train work for us the way it has for Sauber. And parenthetically, how is it that Arrows can make our old Peugeot engine work when we couldn't? One high point of the weekend was that Jean Alesi had the second highest speed - 225.7 km/h in the Intermediate 2 sector of the track, just behind winner Ralf Schumacher. Close by Prost sit the three shiny black European Minardi transporters, the real home team since Minardi's base is only a few miles away at Paenza. 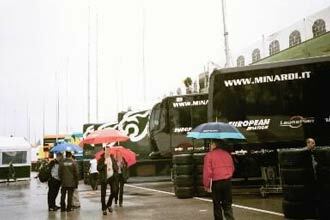 Giancarlo Minardi maintains a constant vigil at the team's motorhome, greeting the popular team's many guests, as if the change in ownership of the team had never happened. Like Minardi, Benetton also has its share of Nice Guys Who Finish (Almost) Last. Surprisingly, Giancarlo Fisichella and Jenson Button together seem to have more joie de vivre than most teammates, all the more remarkable given the abysmal "rebuilding" year they are having as Benetton morphs into Renault, staking the team's future on the radical 111 degree V10 Renault L21 engine that sits low and wide in the chassis. Gone from Briatore's vocabulary are the scornful words he heaped on Fisichella at Indianapolis last year and in return the 28 year old Roman has brought the Benetton home in the points once this season. As for Button, he seems in person to be about the coolest teenage boy you could imagine (though now 21 years old) and amazingly free from the bitterness or self-pity that might be natural given the turn of events that led to Montoya replacing him at Williams just when the team became a winner while Button finds himself squandering his youth at a team that will in all likelihood not win a race for years to come. Button and Fisichella were the only teammates I saw meeting the press together and Button particularly seems to enjoy the give and take. Although they have only 1 Constructors' Championship point between them they get high marks for boosting team camaraderie to buy time for the team while the Renault engineers sort out the engine in Renault's historically deliberate but ultimately successful way. At Ferrari, patience is not a commodity available in bountiful proportions. After showing well in all the practice sessions, Michael Schumacher hurried through the crowd on the Ramblas after ending up fourth on the grid behind both Silver Arrows and again next to his brother Ralf on the same row. The race would not improve his humor as he found himself first with a left front Bridgestone failing him and a pitstop of 32 seconds on lap 23 that effectively ended his race - his first DNF of the year - leaving him tied with Coulthard at the top of the Drivers' Championship. After weeks of Barrichello making bad news going back to his remarks about the City of Sao Paulo and his questioning of Michael Schumacher's conduct in passing him in the wet at Malaysia, Rubinho seemed quietly satisfied that it was his Ferrari - not Michael's - that made it to the podium at Imola, finishing up 1.5 seconds ahead of Hakkinen, preventing an entirely Germanic podium in this most Tifosi of racetracks. And the Tifosi I saw high above the track at Ravazza or low down trackside at the roller-coaster like Aqua Minerale lived up to their billing. Men, women, children and even dogs (how can you not like a country that permits dogs on its trains and at its racetracks!) poured into the track in droves between Sunday Warm-Up and the race, a sea of red caps, flags and capes swarmed around Tosa and Ravazza. The massive crowd took up every conceivable spot along the fences on the straightaway where the people who could not afford a ticket brought in an imaginative array of ladders, pipes, planks and even rope swings engineered to be attached to fences, all contraptions to improve the user's view of the track. And everywhere the Tifosi were watched over benignly by a small army of Italian Police, outfitted with designer uniforms with epaulets, berets, mobile phones and (some) guns and driving about in a United Nations of vehicles from Alfa Romeos to Fiats and Land Rovers. 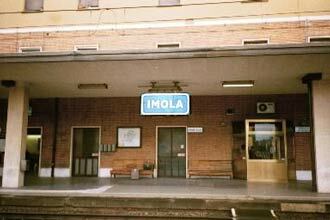 The Imola race was a week after the stampede in South Africa at a football match that killed many fans and the Italian authorities were taking no chances. As it happened, the Tifosi were well-behaved, their enthusiasm perhaps diminished by Schumacher's departure early in the race or their senses dulled by the astounding amount of Warsteiner beer and Italian wines being consumed out there on those beautiful hillsides on what turned out to be a picture perfect day all around. But the Tifosi enjoying themselves out in the noonday sun nonetheless paid their respects to the darker days at Imola. At the modified Tamburello corner, on the inside of the track across from the Parco delle Acque Minerale di Imola, there are several memorials to Ayrton Senna who died at Imola while leading the San Marino Grand Prix in a Williams on May 1, 1994. 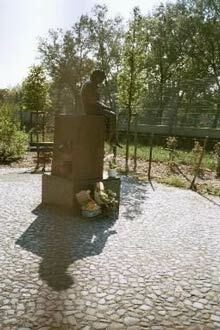 One memorial is a bronze sculpture of Senna in a sitting position, atop a six foot tall base, looking reflective, the slope of his back, his tousled hair and the expression on his face captured convincingly by the artist. The sculpture is behind catch fencing during race weekend but by race day someone had gotten inside the fence and placed a "Nacional" baseball cap on Senna's head which was authentic and of the era and a green and yellow Brazilian flag lay at the foot of the sculpture, unfurled. Flowers and a handmade cross completed what is really a shrine to Senna. Further down the Tamburello corner, there are hand-painted graffiti-like messages on the wall in several languages, one in English saying "Ayrton Senna Forever." There is also a formal plaque affixed to the wall across from the spot where Senna unaccountably shot off into the wall to his death. Right behind Senna that day as they approached Tamburello sat Michael Schumacher as a witness to history, then driving for Benetton; Schumacher took up the cudgels at that tragic corner and has not looked back since. It was as if the torch was passed that day in May at Tamburello, with Schumacher going on to win the Imola race on his way to his first World Championship in 1994. Schumacher has proved a worthy successor to Senna, but these artistic artifacts show that the memories of Senna at Imola are as fresh today as the flowers placed at his memorial at Tamburello. Requiescat in Pace. 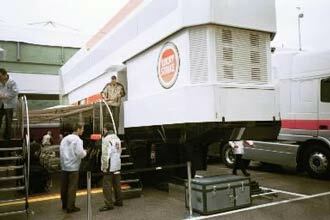 Once Ralf Schumacher won the race and even before the press conferences had been concluded, Grand Prix racing was over and Truck Racing began - the subtle maneuvering for position by the teams' truck drivers who back up the narrow Ramblas to hook up the cabs of their trucks to their transporters and head home, mostly to England. Ironically, as in the race, the huge BMW-Williams truck ended up first in line. The team from Grove is on a roll.